Hoi An distils all the finest attributes a town in Vietnam could possibly offer. 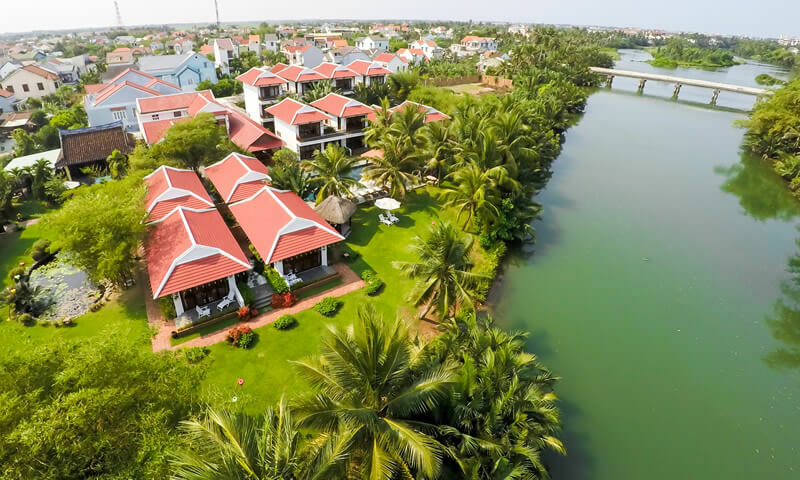 It boasts some of the most sophisticated and elegant architecture in the country, which combined with its location on the banks of the languid Thu Bon River make it arguably the most alluring urban centre in the country. 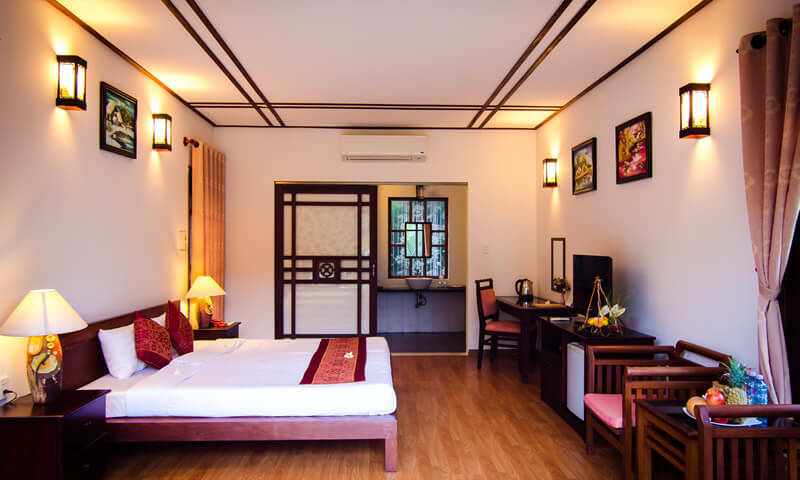 Hoi An is a UNESCO world heritage site largely thanks to the Old Town, which is one of the best preserved examples of a trading port in the region. Its culture and heritage derives from the ancient Cham kingdom, which once controlled the lucrative spice trade from far eastern Indonesia. But atop there are a myriad other influences – notably Chinese – and the Old Town is filled with Chinese shop fronts and temples as well as Japanese and European influenced buildings. The town’s cosmopolitan character has continued to develop with the advent of tourism – it’s a great foodie destination and alongside its traditional aspects, the town offers a host of comforts to visitors, from boutique restaurants to sophisticated bars. 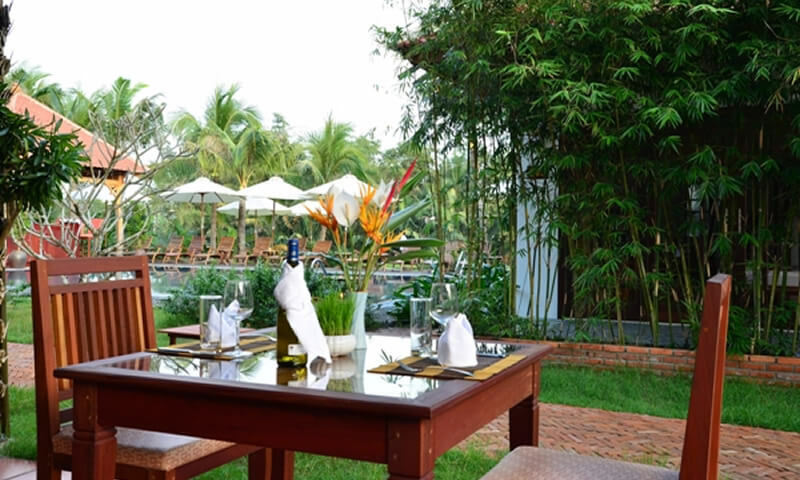 The 29.4km drive from DaNang Airport to Karma Cây Tre takes approximately 42-minutes. 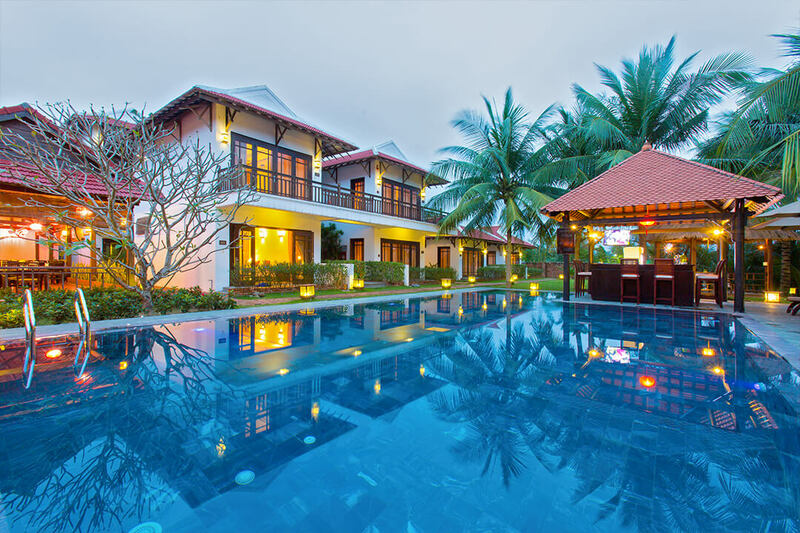 Transfers can be arranged through Karma Cây Tre or your Karma Concierge in advance. Alternatively, there are plenty of taxis available – just be prepared to negotiate! 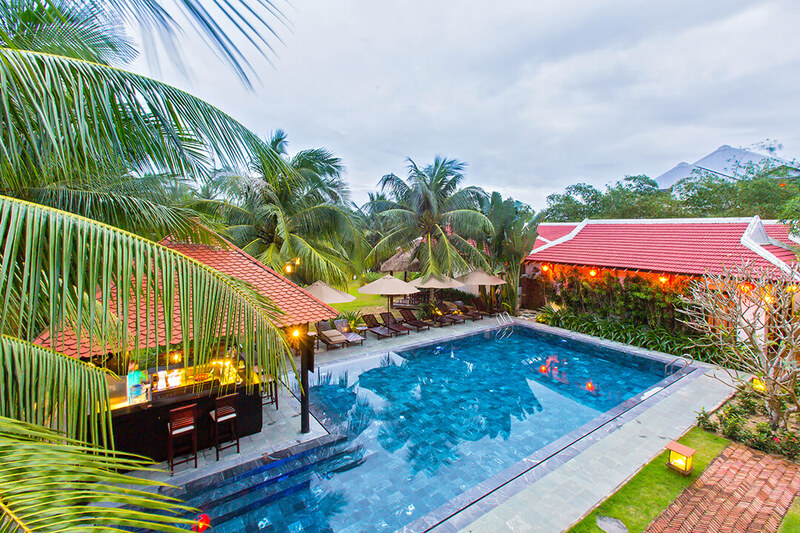 Stands of shady coconut trees punctuate a beautifully manicured lawn & tropical garden, which borders our expansive pool. Pick from a wide selection of cocktails, beers, wine and other beverages as well as snacks at the full-service pool bar. The perfect place to wile away a lazy afternoon. 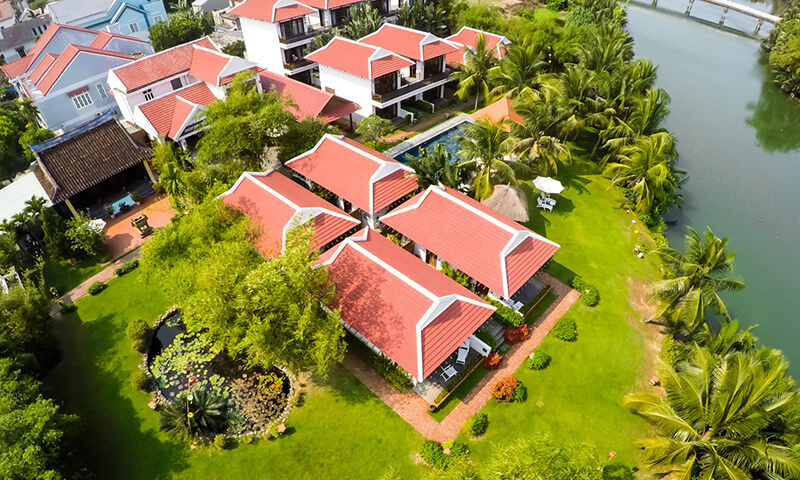 Situated just 1km from Karma Cây Tre and accessible via bicycle, motorbike, taxi or by foot, is Cua Dai Beach, a scenic stretch of palm-fringed, white sand, with views of the Cham Islands. Our front desk handles exchange of all major currencies. Vietnamese Dong – bank notes come in denominations from VND 500 to VND 100,000 with exchange rate of approximately VND 22,300 to US$1. 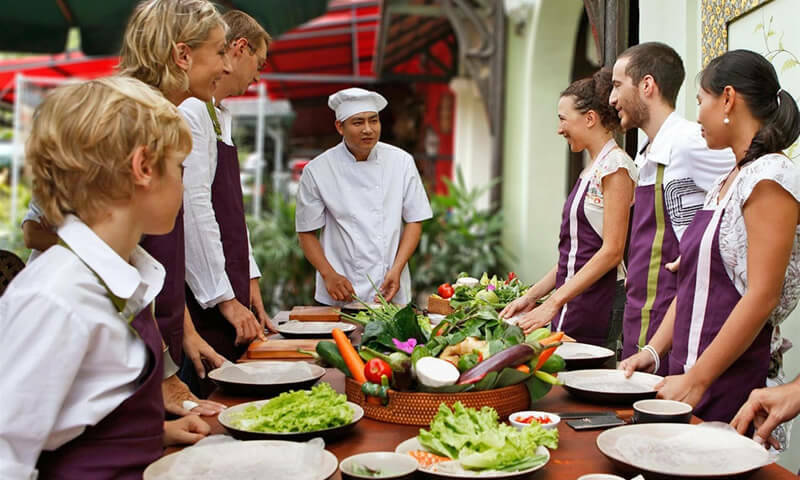 We offer Vietnamese cooking classes suitable for the entire family. 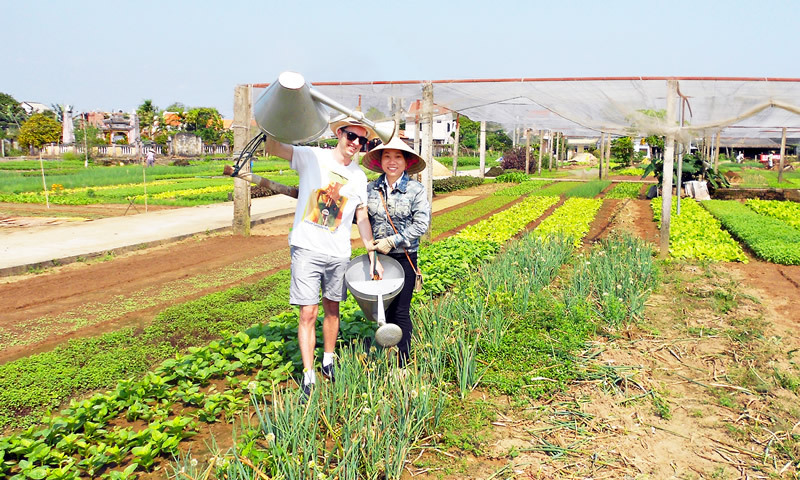 Discover one of the most sophisticated and popular South East Asian cooking traditions, which is now popular around the world. 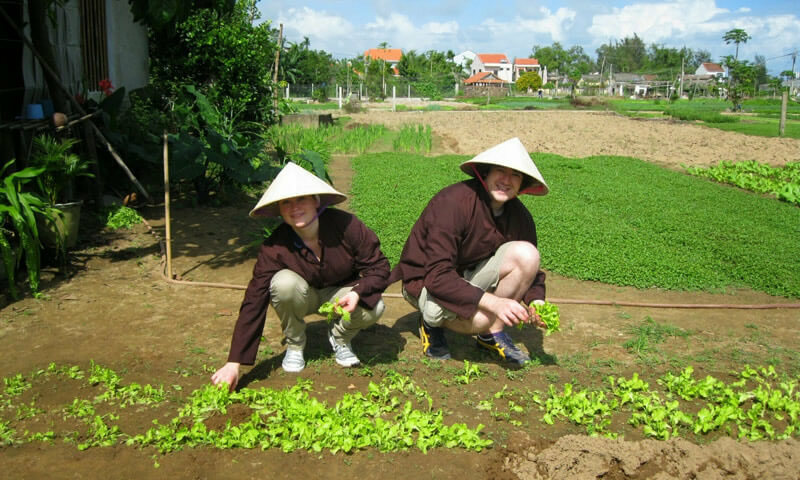 Learn to make classics like Banh rice cakes and rolls, to Pho soups to Goi Cuon spring rolls. 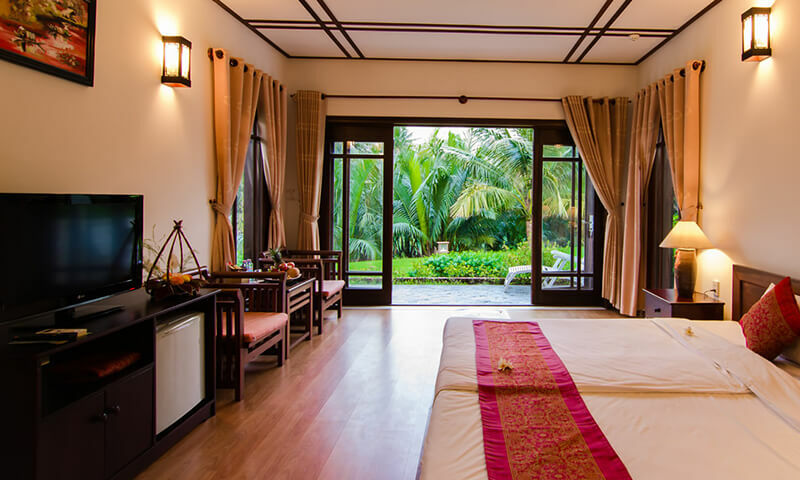 Located by the riverbank are eight rooms that gaze out over the quaint Do River as well as the lush gardens. These premium rooms are the perfect choice for couples on a honeymoon or romantic getaway. Six rooms face our blue stone-tiled swimming pool, past the gardens and the Do River in the near distance. Relax in cool & spacious environs, complete with double bed and en-suite with large tub and shower. 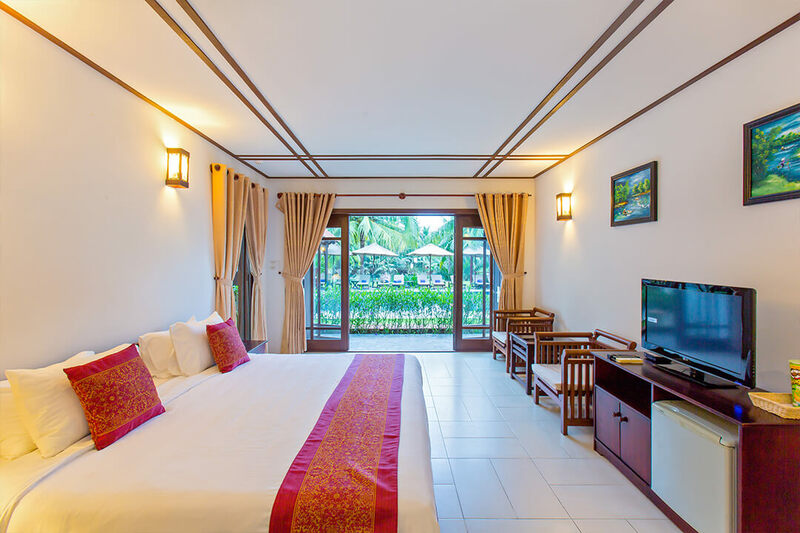 There are eight rooms that feature views of our beautifully landscaped gardens lined with coconut trees and other tropical flora. 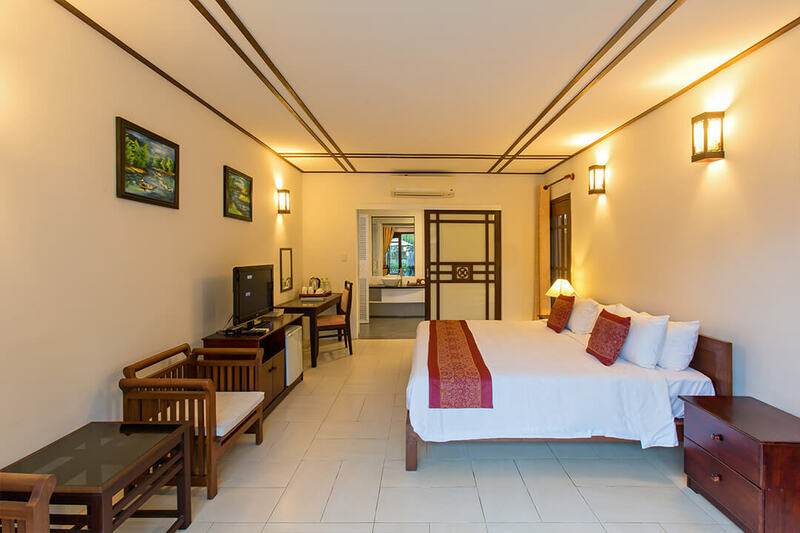 These rooms also offer a perfect choice for a romantic excursion, featuring comfy double beds and en suites with a large tub and shower. 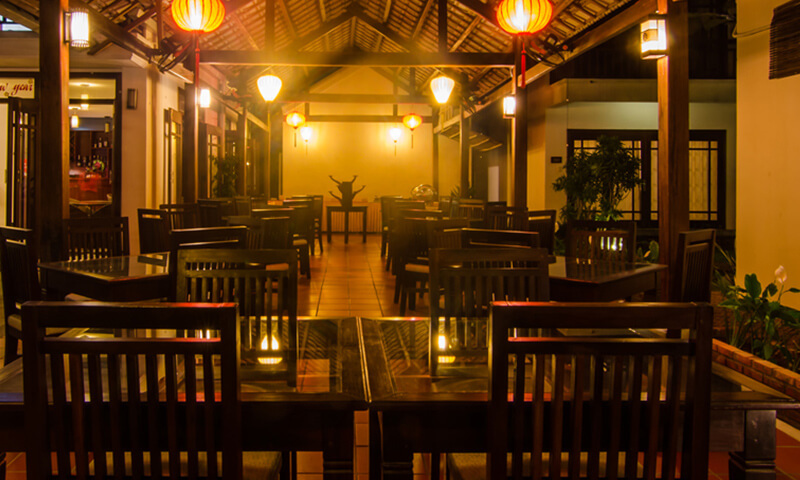 Our semi al fresco courtyard restaurant is traditionally decorated and serves delicious renditions of classic Vietnamese dishes as well as international fare. 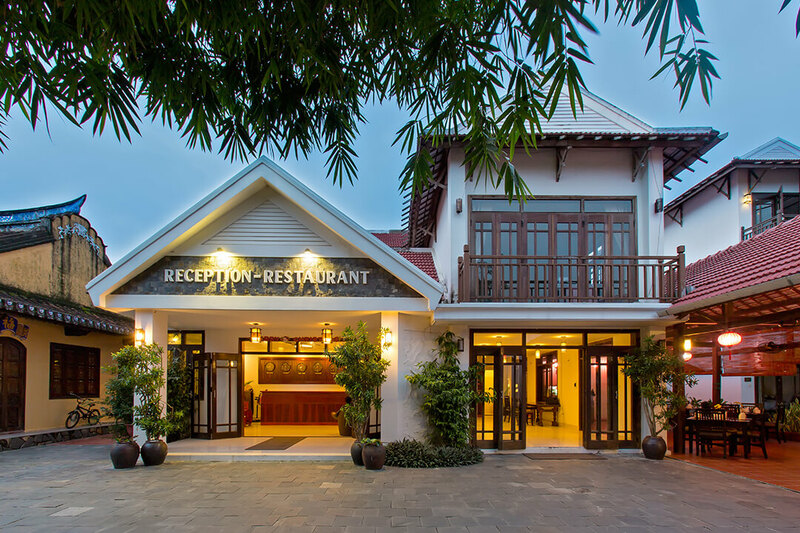 Our breakfast buffet offers a wide selection of Asian and Western cuisines and there is also a specially designed international ala-carte menu available for dinner. Imagine celebrating your special day on our lush lawn, surrounded by tropical greenery, alongside the riverbanks of the picturesque Do River. Karma Cây Tre has indoor and outdoor facilities available for your dream wedding ceremony and reception and our staff is able to assist with any arrangements involved with planning a wedding at our charming venue.